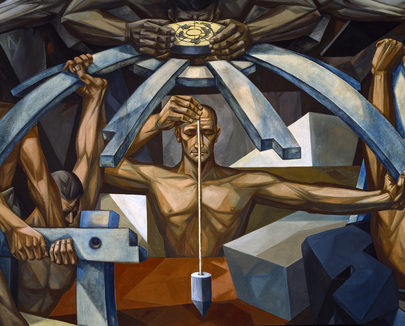 This mural, depicting "Mankind's Struggle for Lasting Peace", was created by José Vela-Zanetti of the Dominican Republic under a fellowship from the John Simon Guggenheim Memorial Foundation. The mural begins at the left with the destruction of the family and ends at the right with its resurrection and a bright eyed child looking toward a generation of peace. Detail of the center panel, in which a giant, four-armed figure implants the emblem of the United Nations.